Are you concerned that your child’s challenging behaviors are unchangeable? Are you worried there’s no way to teach your pre-verbal child? Do you have sleepless nights wondering if your child will ever socialize with peers? This may surprise you, but there’s a technique called video self-modeling that works through all of the challenges listed above and more. 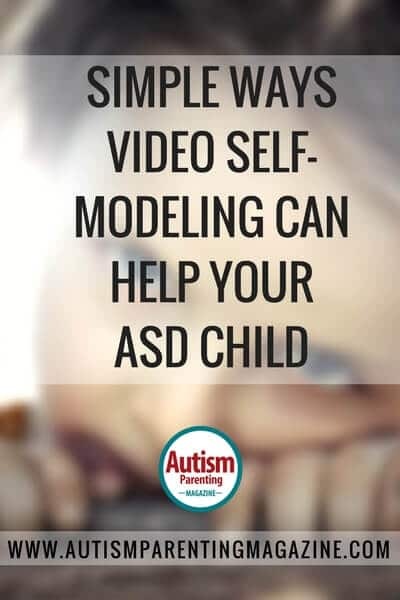 Video self-modeling (VSM) has been scientifically tested for nearly 50 years and has stamps of approval from national autism and exceptional children organizations. VSM lets children watch themselves successfully perform a behavioral goal on carefully created and edited videos. The key is to edit the raw footage so the final video shows only successful behavior—all errors are removed. VSM is a positive, technology-based technique that is tailored to your child’s particular needs. The best part is the technology to complete VSM is probably in your pocket right now. If you haven’t heard about video self-modeling before, you are not alone. VSM previously required expensive equipment—a lot of it. What can now be completed from start to finish with a smartphone or tablet used to require eight pieces of expensive technology. Only researchers at large institutions had access to such equipment, which is why we have so much research supporting VSM. However, that’s also the reason few people know about VSM—nobody was practicing it in the field because costs were so high. Today, using free software and the technology in your pocket, VSM is accessible to everyone. This means you can use it with your child at home, and your child’s providers can also use it. A goal behavior should be something that will help your child be more successful in life. It should always be a positive goal behavior. Talk about what your child will do instead of what they will stop doing. This lets your child work toward something positive instead of running away from a problem. Each video should focus on only one goal behavior, and it should be specific. Something like, “Colin will ask his brother to play” would be a good goal behavior for a child who does not initiate play with others. If your child already performs the behavior naturally but only once in a while, have your camera ready so you can catch him/her showing it. If he/she doesn’t, you may need to prompt the child to show the goal behavior. By prompt, I mean you may need to stand behind the camera and say, “Colin, look at your brother Patrick and say, ‘Hi Patrick, do you want to play LEGOs?’” Make sure to also prompt Patrick to enthusiastically say, “Sure!” with a big smile and show them beginning to play together. If it’s a physical behavior you want him/her to show, like taking off a coat, you may need to gently, physically prompt the child to put his/her hand on the zipper and pull it downward. Prompts should always be respectful, gentle, and informative so you can get the goal behavior on video. Your final video should not show the prompts, though, so make sure you get some clips of your child pulling down the zipper without your help. Smartphones and tablets have cameras that allow you to video record your child. Make sure you’ve selected the “video” option in the camera app and press record. There are inexpensive tools available that will clip your device to a table or tripod if you want to have your hands free to help prompt the behavior. Make sure you record long enough to make a final video that lasts from about 30 seconds to several minutes. Let your child know what you’re up to—tell him/her you’re making a movie and that he/she will be the star of the movie. Let the child know that the movie will help him/her perform the goal behavior and how it will help in life. Say something like: “Colin, we’re going to make a movie and you’re the star! The movie is of you asking Patrick to play. This will help you make friends at school.” Be positive and clear! Smartphones and tablets have access to video-editing apps that are either free or inexpensive. You don’t need a complicated video-editing app—the free ones will work fine for what you need. Once you’re familiar with the editing software, edit your child’s video to remove all prompts and all errors. Your final video should only show your child successfully performing the goal behavior. Include images of your child looking satisfied with him/herself at the beginning and in the end. You can also record a voice-over at the start and end of the video that names the goal behavior. Something like, “Here’s Colin starting a conversation with his brother” would be appropriate. The final video should be between 30 seconds to 4 minutes long, depending on attention span and the goal behavior. You should show the video to your child on your smartphone or tablet every one to three days until he/she consistently performs the goal behavior in real life. If the child likes the video and shows immediate changes in behavior, you can show it every one to three days and then start showing it less often until it’s no longer needed. If the child seems to need the video as a reminder of the behavior, you can keep showing it every few days or weeks. Use your judgment on what is best for your child. If your child’s behavior does not change within six weeks, evaluate your video and determine if it needs to be changed. Did you mistakenly include prompts in the video? Does the video not clearly show the goal behavior? Does the video have other distracters in it, like other people? Make a new video once you decide what the problems were with the first one. Remember to be respectful of your child’s privacy—this video is for his/her use only, not for sharing on social media platforms. Video self-modeling can be used by teachers, speech and language pathologists, school psychologists, physical therapists, occupational therapists, and social workers. Encourage your child’s school system to train their professionals on how to use video self-modeling. Tell them that it is an evidence-based practice that can help not only your child but many others. It can help children and adolescents with transition skills, self-help skills, academic skills, vocational skills, and more. Help your system learn about this cutting-edge, technology-based technique! If you need further help using video self-modeling, take a look at research and online articles about the technique, as well as books. Once you become comfortable with the process and technology, you will likely find yourself using it often. Melissa M. Root, PhD is president and owner of the behavior-change consulting firm Root Success SolutionsTM LLC and is a certified school psychologist in Connecticut. Dr. Root developed the RootSuccess™ Video Self-Modeling Learning System, which includes in-depth trainings as well as optional coaching and technology supports in order to ensure and sustain success with video self-modeling. Dr. Root is co-author of Picture Perfect: Video Self-Modeling for Behavior Change, which is available from Pacific Northwest Publishing. She presents internationally on video self-modeling as an effective tool for positive behavior change. Dr. Root uses video self-modeling with children and adults to teach a wide range of positive behavioral goals. Dr. Root may be reached at root.success.solutions@gmail.com. Her website is www.rootsuccess.com.